Social Media is always changing as you know. By the time you figure it out, something else is being tested or rolled out. I am not a fan of all the changes, however there are some that are fantastic and will help your business grown online through the power of Social Media. As you have heard, groups are extremely important on Facebook now. I haven’t moved all my clients over yet though but it’s in the future. If you sell a product, it will benefit you more than a page and you most definitely need a group page.You do need a business page to run Ads, however some Ads are starting to show in groups so we will see if that sticks. I am pretty sure it will and my theory is Facebook business pages will be obsolete. Instagram Stories are now being used by 500 million people daily. That’s a lot of users you are potentially missing if you aren’t on Instagram. Have you ever sent a message to the wrong person? We all have. Wish you could take it back? Well, now you can. Messenger now has a 10 minute window to un-send that message that could come with some explaining if seen! Better be quick though, they an still see that message anytime they chose and as Ricky Ricardo would say “Lucy, I think you’ve got some ‘splainin’ to do.”. Long press the sent message and it gives you an option to remove for you or remove from everyone. Just a few updates you need to know about but they won’t do any good if you don’t use them. So go on, head to your social media platforms and work your magic. Consistency on your Social Media accounts is so very important! Your followers want to be able to depend on when you share a new blog post or share something specific that you often post about. I try to post something motivational on Sunday nights to start the week off right. OH gosh, see I said TRY. Even a Social Media Manager doesn’t always get it right. I have had some personal issues lately and slacked off. However, a few months ago, I started being very consistent on my platforms. I can see the little ways it is paying off that will hopefully lead to big ways. For instance, retweets on Twitter that I never get. Unfamiliar faces liking and commenting on my pages. Also, a few “old” faces I haven’t seen in a while. The best way for me to remember what/when/when to post was to make a daily checklist. I listed all the different platforms that I post on. I also numbered how many times I need to post daily. I started getting in the habit of checking it off daily. I LOVE to scratch off something on my to do list anyway. Its the feeling of accomplishment the pleases me. Don’t forget your personal Facebook either. Everyone should be posting on there at least 1x daily. It’s too complicated to worry about all the different ways to post until you get better in the habit. Instagram has stories, Twitter has video, Snapchat has stories, it’s all a bit too much sometimes. Just post something of value or just for fun daily (or several times depending on the platform). Of course, live video and regular video are essential. That’s one area I am lacking but I have my list of business to go in and video and that will help. 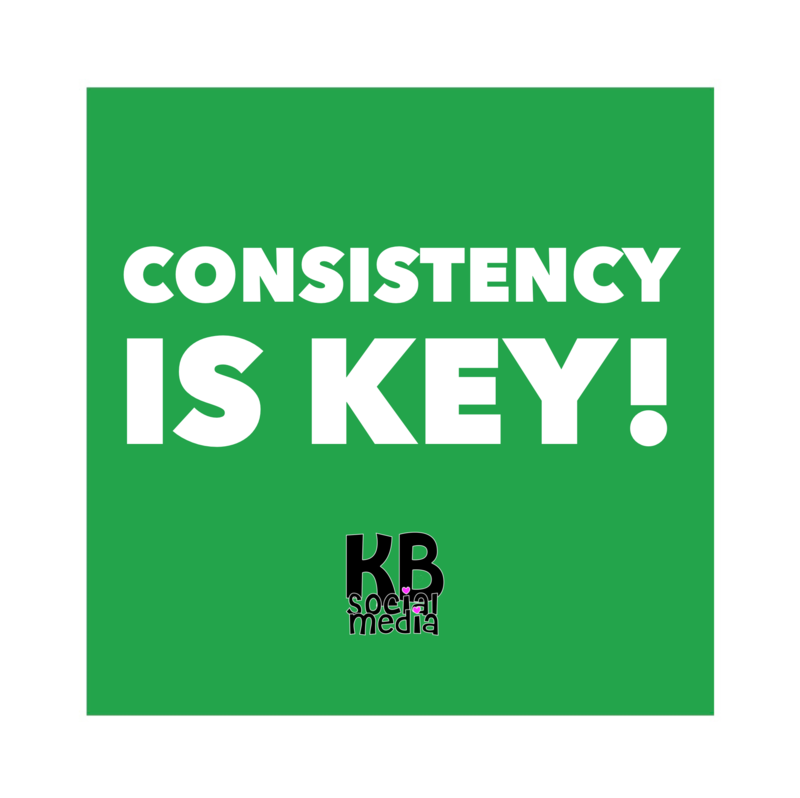 Listen, it is so important to present yourself as a authority in your business and being consistent with your social media will help you accomplish that. For most businesses you need to be on Facebook, Instagram and/or Twitter. I can help you choose what is best suited for you. Remember to post value but also fun/entertaining/questions to boost engagement. You should post things that relate to you and your business and posting what your readers want to see. On all my pages it is typically the random questions that get the most engagement. The informative posts are good but I tell by can watching the insights and see most people love the funny posts the best. We turn to social media for news of course, but we love to get away from the stress of daily life and be entertained even more so!! So, go on…ask your readers what they are having for dinner or who their favorite singer is and watch your engagement increase!! Don’t forget a photo to increase your chances of a bigger reach. Don’t you agree that sometimes we make things way too complicated? 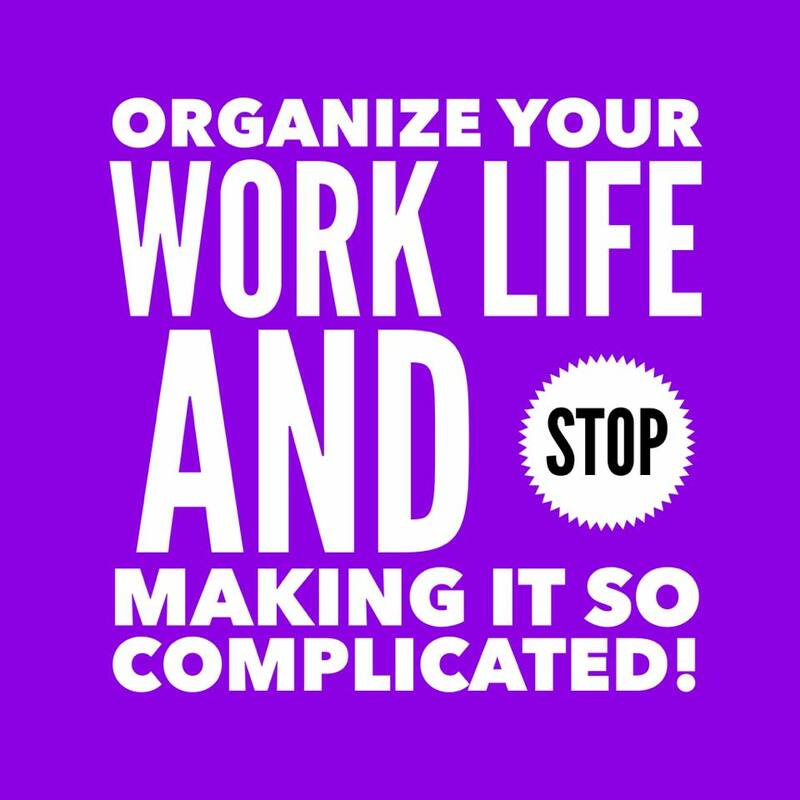 We are so busy, it’s hard to stay organized and on top of everything. 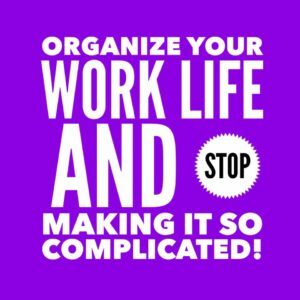 For me, I get a few things done- and here comes more, more and more to do items and it is hard to keep up.Below I share a few simple tips that help me stay organized…it parts of my business and personal life..at least in some areas. Someone calls and needs us to do something and we write it down on a scrap of paper or text it to yourself (Come on you know you do!) or a multiple host of other ways you to keep track of your to- do lists! How many times though are we losing things, forgetting because the note wasn’t in front of us or we are so overwhelmed that we just don’t know where to start?! Who feels me!?! Streamlining those projects and things we have to do can certainly help your day be more productive. Instead of looking for that note, “Where did I put it? !” We can cross things off our lists. I absolutely LOVE when I finish something even if it just a small thing. Something so satisfactory about that check mark! For me, I still use a paper planner. I know what you are thinking. Social Media girl who still uses a paper planner? I love the feel of paper! So, everything personal, business, home life ALL goes into that ONE planner. Why have separate ones for work or personal and risk planning something on the same day? Tooooo much to keep up with! Sounds silly but this works for me-If a client sends me a request, I screen shot it immediately. I have trained myself to check my screenshot folder on my cell phone daily and write it down on my paper planner (typically I have it with me though!) Tell me when you don’t have your cell for ten minutes, you know you do! I always make sure I pick a small enough planner that I carry it with me almost everywhere. So, screenshot to planner! That’s it! it isn’t rocket science and if it was- I wouldn’t know how to do it. HA. I do have a notepad next to my bed and don’t feel like using my phone (Oh yeah, sometimes I need a break!) just in case I need to write something down, check it daily and write it in the paper planner. but this is a rare case because it is once again, another thing that can get lost or forgotten. If you think of something you need to do even if it isn’t for someone else, send yourself a text and use the screen shot method as I mentioned above. It works for your reminders too, not just business. Grocery list, people to call, reminder for your spouse..etc! The reason I say text and then take a screenshot is so that is doesn’t get lost in your texts- remember I am daily checking the screenshot folder so my texts to self- would be in the folder! Oh yes, I text myself. Is that not a thing?!?! ** Delete those screenshots after you write it on your planner or add it to your online calendar. Or, you will just have another thing to do later. DO IT NOW-don’t get frustrated later. A few systems that you can remember and get in the daily habit of. Keep it simple, you will be more likely to stay calm and get things done. This concept works if your a digital person as well. Use your screenshot folder then make notes on whatever online calendar you use. That is if you can’t write it on the calendar immediately. Technology is not always our friend ya know. 1 or 2 places MAX, pick a simple method and STICK WITH IT. No more looking for that damn sticky note. No more forgetting because you have the simple habit in place. You may think my idea is odd so come up with your own! There is a method to my madness, find your own method. POINT BEING-Simple and consistent is the key! Stop over complicating and take a few minutes to come up with a system that is simple and works for you. Don’t toss the sticky notes though, they are good for other things! I use time blocking when I am working from home and I always do the thing I dread the most-first. Get it out of the way and go about your day.